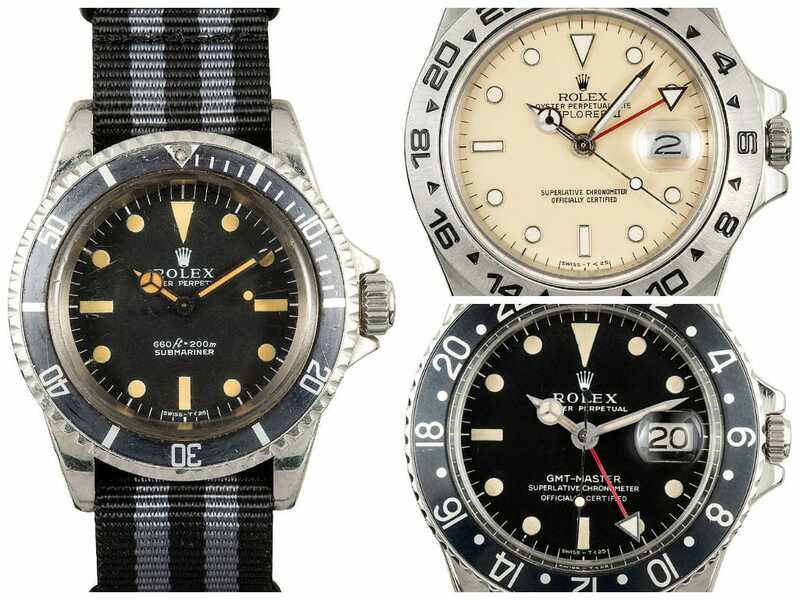 A well-made Rolex sports watch is always in style, even if it hails from a bygone era. In fact, certain factors such as an unusual story, relative rarity and retro appeal make some vintage Rolex models even more desirable than current versions. If you’re looking for a throw back, then look no further than the Submariner 5513, Explorer II 16550 or GMT-Master 1675 for some old school cool. A Rolex Submmariner 5513 is a rare watch made for divers to reach incredible depths. 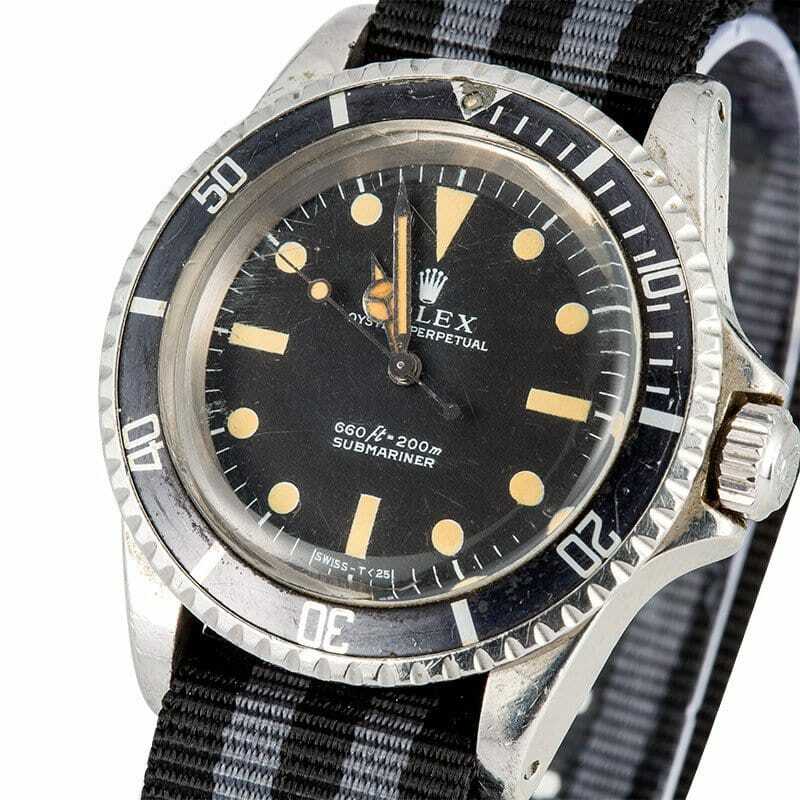 From the Rolex line of diving watches, the Rolex Submariner 5513 was manufactured from 1966 until the mid-80s and this particular model is dated from 1971. The black dial of this Sub 5513 “no date” features orange creamy hour-markers along with matching tritium hands for a superb vintage vibe, and the face of the watch is protected by acrylic crystal. On the 40mm stainless steel Oyster case of the ref. 5513 is a rotatable diver’s bezel with a black “fat font” insert that has naturally faded over the years. This 44-year-old Submariner is presented on a black and grey NATO strap for a slick military appeal, channeling a little bit of James Bond. This Rolex Explorer II 16550 with a creamy rail dial. Part of the Rolex collection for adventure seekers, the Rolex Explorer II 16550 is known as a “transitional” model between the Explorer II 1655 and 16570, and was produced for only four years from 1985 – 1989. Two types of dials were offered with the ref. 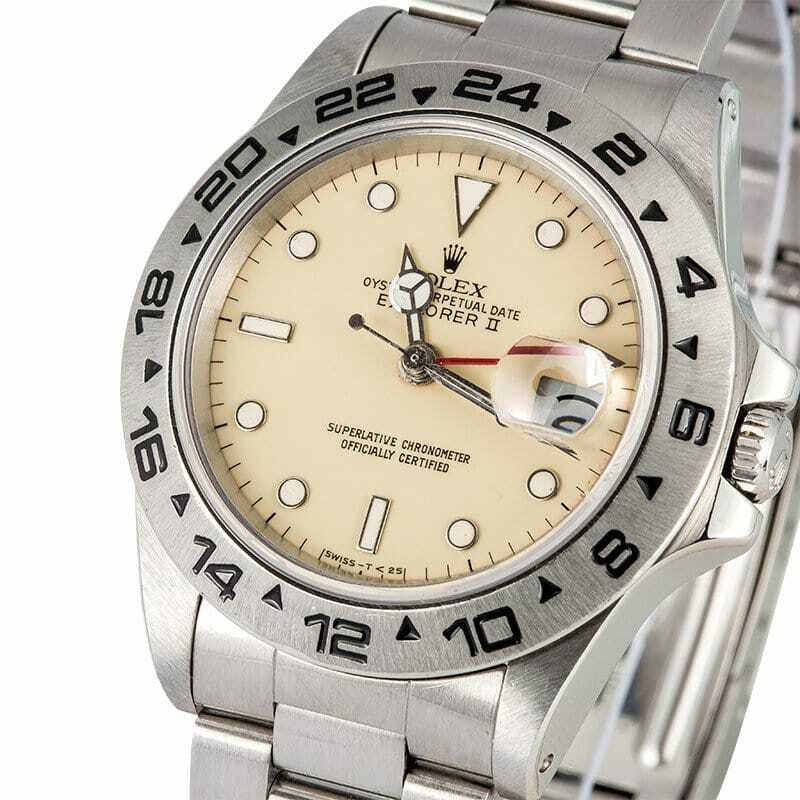 16550 – black and white – and the white dial versions are the most interesting of the two because of a paint flaw that turned the white into a creamy ivory color, as seen in this particular Explorer II. The defect was later fixed by Rolex in future models, so coming across an Explorer II with the white-turned-cream dial is a rare find. Another noteworthy trait of this specific dial is that the letter “Cs” in “Chronometer” and “Certified” align perfectly, classifying this as a “rail dial”, a minute detail that excites most Rolex collectors. On the stainless steel case is the original “fat font” bezel in mint condition, and the watch is outfitted with the 78360 stainless steel Oyster bracelet. 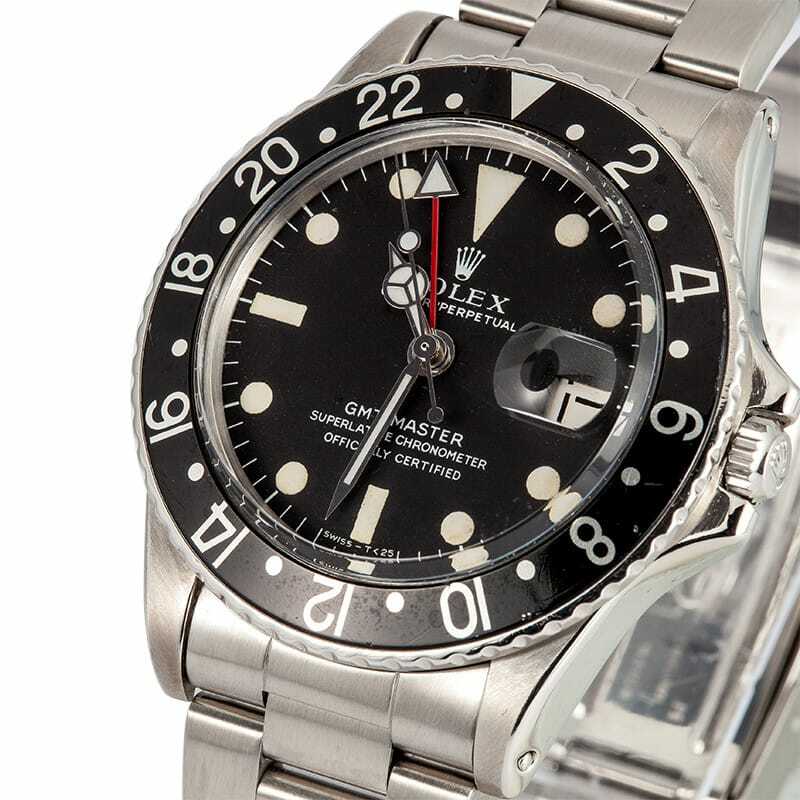 A Rolex GMT-Master 1675 has an all black bezel unlike the Coke or the Pepsi. A Rolex collection that allows world travelers to keep track of dual time zones simultaneously, the GMT-Master 1675 enjoyed one of the longest manufacturing runs in Rolex’s catalogue from 1959 until 1980. Yet, 35 years after production ceased, the GMT-Master 1675 still remains as one of the most popular vintage Rolex sports models today. This particular reference 1675 from 1967/1968 features a black matte dial with a red GMT-hand protected by sapphire crystal, large luminous hour-markers, and an aged replacement black insert on the bidirectional rotatable bezel. The stainless steel Oyster case is furnished with a stainless steel Oyster 93150 bracelet with 593 end links and 13 links.